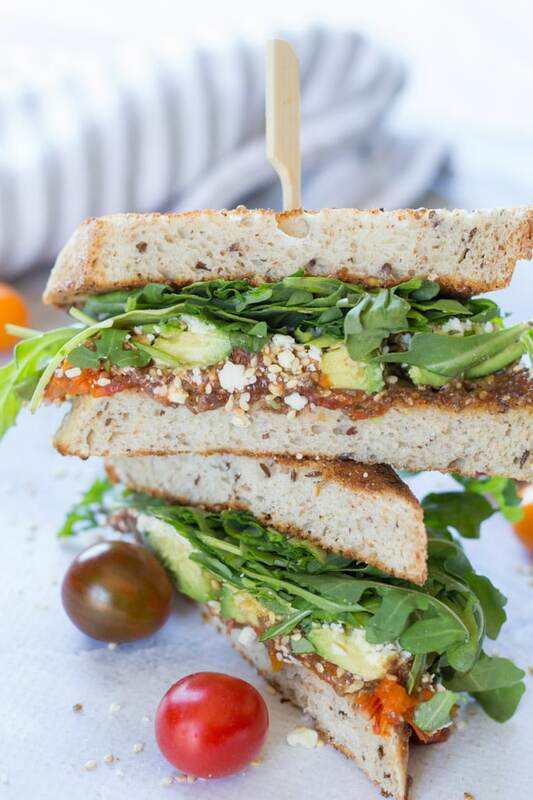 Messy Tomato Jam Sandwich with Avocado and Arugula. The name says it all! 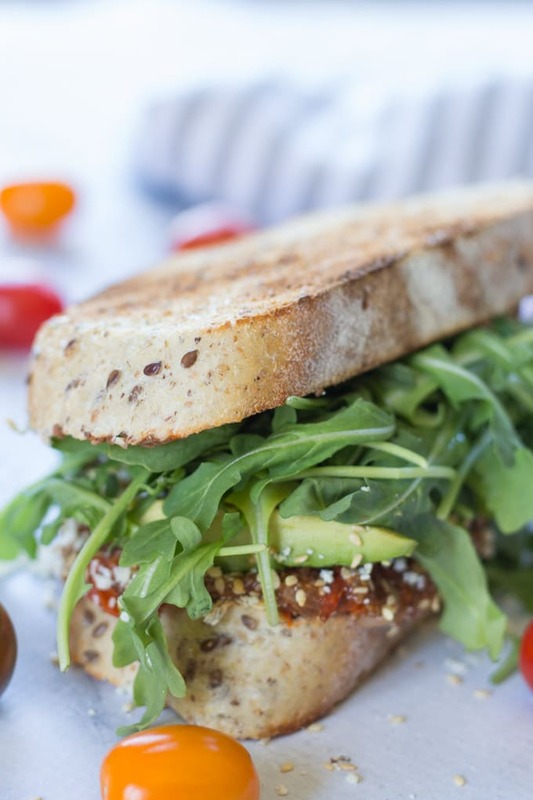 This sandwich has avocado, arugula, feta, chia and sesame seeds. But the game changer on this sandwich is the spicy tomato chia jam. Yep. More chia. What can I say? I love chia…especially in jam 🙂 . And this savoury jam rocks this sandwich! I first made the spicy tomato chia jam a few weeks ago when I had some friends over for drinks and recipe sampling. This tomato jam started off the evening. I paired it with some fresh mozzarella and baked it on slices of French bread. Yum! The jam is a little bit spicy (because of the red pepper flakes 🙂 ), but the cider vinegar, garlic and honey balance it all out. It is seriously delicious! So since I first made the jam, I’ve been adding it to recipes wherever I can! My favorites so far have been avocado toast with spicy tomato chia jam and, of course, this Messy Tomato Jam Sandwich! I call it messy because the pile of arugula on it just makes it look messy, and also because I get messy eating it. No joke. We are talking jam and avocado in my hair kind of messy! What can I say, I inhale my food, which means there is no time for neat and tidy eating! While a sandwich is typically a lunch thing, this sandwich is so filling, you could definitely eat it for supper. Or maybe even breakfast? At least then you have the whole day to work it off! You could even sneak an egg on there if you were absolutely starving! The fibre and healthy fats from the chia and avocado are the reason this sandwich is so filling. You will forget that it is a vegetarian sandwich. Unless you add bacon, which I think would be totally awesome with this jam! I like to pile on the arugula. Not only to get my fix of greens, but also because the peppery taste of the arugula just goes so well with the avocado and spicy jam. I usually serve all these ingredients in between two slices of toasted ancient grains bread (although the bread in these photos is flax bread). If it’s too much bread for you, you can definitely try this as an open faced sandwich. If you do, you may feel the need to use a fork and knife. But since this is called a Messy Tomato Jam Sandwich, perhaps you should forget the fork and knife, and just dive in with your hands and get messy! 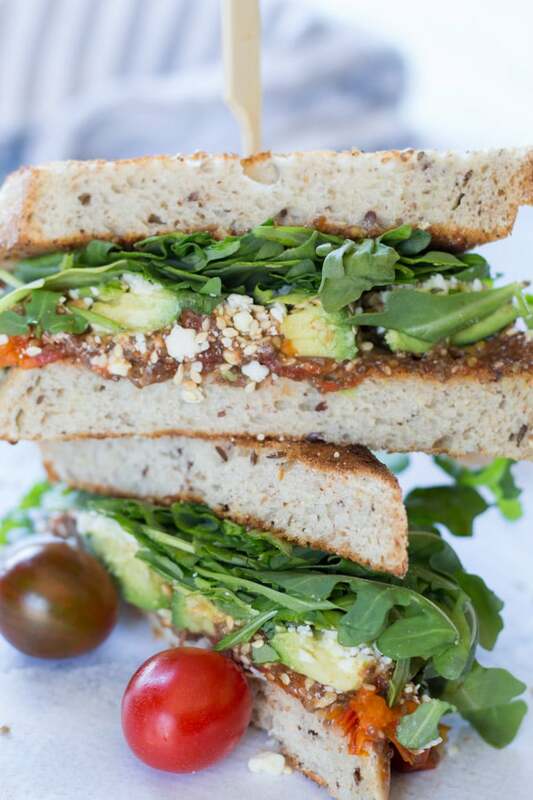 This Messy Tomato Jam Sandwich with Avocado and Arugula is clean eating enjoyment! 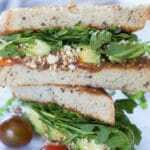 The fibre and healthy fats from the spicy tomato chia jam and avocado make this sandwich super filling and delicious. You will totally forget that it’s a healthy, vegetarian sandwich. Be sure to bring some napkins because it’s gonna get messy! In a small sauce pan, add the tomatoes, honey, cider vinegar, onion, garlic powder, salt, red pepper flakes and pepper. Bring to a boil on low heat and let the mixture cook until the tomatoes and onions are soft. This will take about 15 minutes. Mash the mixture with a fork or potato masher. Stir in the chia seeds and let simmer for a few minutes. Stir the jam to ensure it doesn’t burn on. Remove from heat and let sit covered for 20 minutes. Divide the jam evenly amongst 2 slices of toast. Sprinkle with sesame seeds and feta cheese. Add the sliced avocado and pile on the arugula. Top each with the other slices of toast. Cut and serve. Makes 2 sandwiches.